The last month of school for the boys really saw their French take off; I am really proud of them. Their last month of school consisted of finishing up school projects, heading to fun class trips to nearby ropes courses and pools or Alpine hikes and coasters, athletic field days and class parties. In their free time, they headed to the public pool, called “Les Bains de La Motta.” This pretty 1920s-era pool, a five-minute walk from our apartment, is a great deal and is a central hangout for people of all ages. Ernst also spent countless hours playing with friends after school – making homemade movies, playing in the river near school and often somehow ending up at other people’s homes, claiming to have been invited (cough cough). He is actually quite sad to be leaving Switzerland now and is already planning his goodbye tour when we return from our month of traveling for a week before heading back to the U.S.
Just a couple of days after the boys’ last day of school, we set off on our 31-day road trip. The first day was a little nutty… we had decided to cram in a lot. 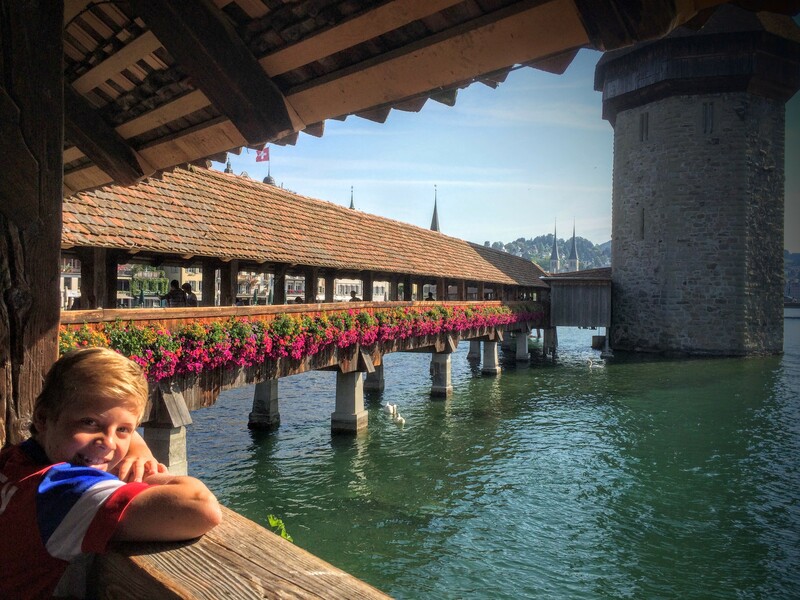 Luzern was the last Swiss destination that ranked really highly on my list we hadn’t visited yet. So although an hour in no way does it justice, we stopped for breakfast and a walk. Beautiful! I see why people love it and am glad we made it there to at least get a sense of it. 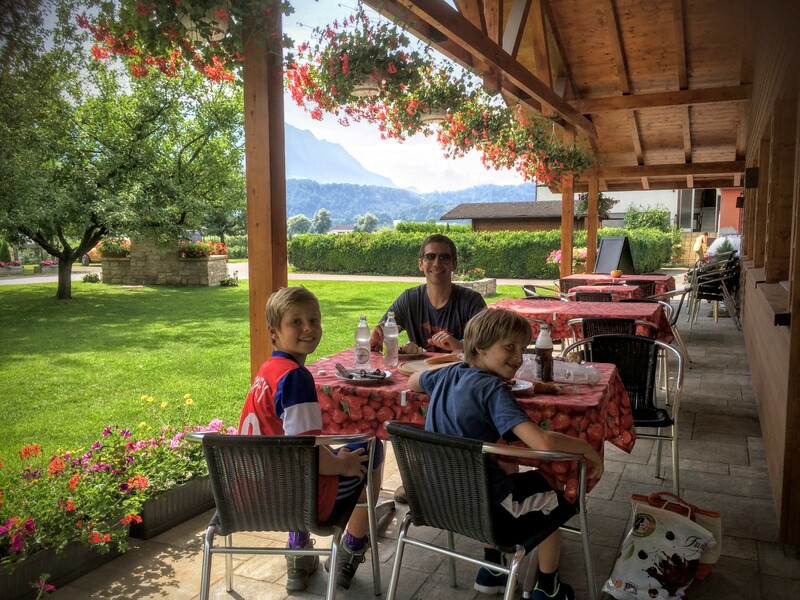 Then, just for fun, we stopped in the tiny country of Liechtenstein for lunch. Of course, it’s indistinguishable from Switzerland (at least to us). Instead of paying a fortune for a well-reviewed restaurant, I’d decided to stop at a farm to buy picnic items. Their selection was a bit paltry, but the quality was decent, and the setting was nice. And hey, we lunched in Liechtenstein! Rain was forecast for our visit to Neuschwanstein Castle, the famed creation of Mad King Ludwig that Disney used as a model for its iconic symbol. However, luckily for us, the rain held off for the most part, and we had a vigorous 30-minute hike up the road to the castle. Everyone has to park below and either pay (and wait in line) for an atmospheric horse carriage ride or – if your parents frame their frugality and impatience as enthusiasm for exercise, walk. (In our defense, we had been cooped up in the car all day). I will say that once again, I was happy I’d gotten tickets in advance. The non-advance-ticket line was pretty long, and tickets were sold out until 6pm, as opposed to our 3pm tour. If you want to see the inside of Neuschwanstein, you have to take a tour. It’s quick, and the inside is pretty; I’m glad we did it. Fritz was especially engaged, because he really loves the movie Monuments Men about the rescuing of art stolen by the Nazis, and Neuschwanstein was one of their storage areas featured in the film. 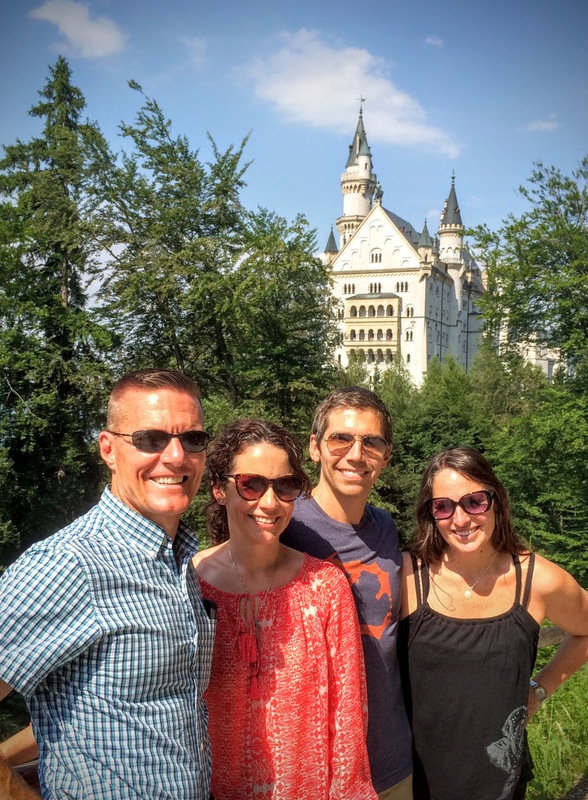 While we enjoyed the visit to this picturesque castle in its stunning setting, the highlight came afterwards, when we ran into old friends on the path outside the castle. Becky (along with three other gorgeous women!) was PapaHatch’s housemate when I first met him almost twenty years ago! It was great fun to see them again in such an unlikely place and meet each other’s kids. Crazy running into old friends at Neuschwanstein Castle (Germany). The rain finally started in earnest as we were leaving, and unfortunately, it continued throughout our short, one-night stay in adorable Oberammergau (Germany). Oberammergau is famous for its once-a-decade Passion Play, which the whole town performs as part of a deal it made with God almost 400 years ago to spare it from the plague. This not being 2010 or 2020, however, there is no Passion Play this year, but I wanted to go back to Oberammergau because of my fond memories passing through with my mother thirty years ago. It did not disappoint – it’s so cute! Houses and buildings throughout the town have painted walls, many telling familiar fairy tales. Our pleasant hotel was very close to the Little Red Riding House and Hansel and Gretel houses. 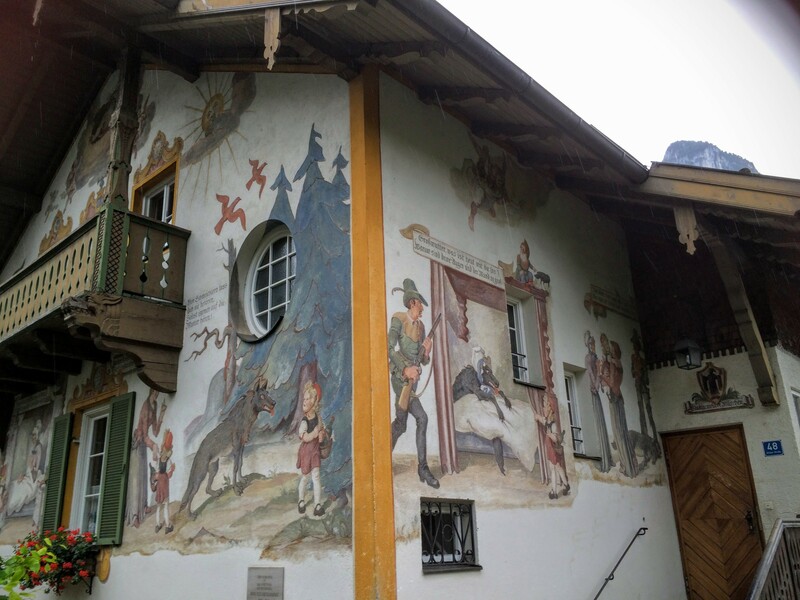 Cute fairy-tale-painted houses in Oberammergau, Germany. The next day, we drove through the Italian Dolomites (a beautiful section of the Alps) to Ljubljana, Slovenia. During breaks between thunderstorms, we did catch some magnificent views, and it was fun to have had breakfast in Germany, lunch in Italy and dinner in Slovenia. I had planned to stop at the “steepest Alpine slide in the Alps” (in Mieders, Austria), but the rain put the kaibosh on that plan. I had been really looking forward to Slovenia as an introduction to the former Yugoslavia (and because I’d heard terrific things about it). The country broke away relatively peacefully in 1991, with only a ten day war… as opposed to the extended and terrible bloodshed in neighboring Croatia and Bosnia. 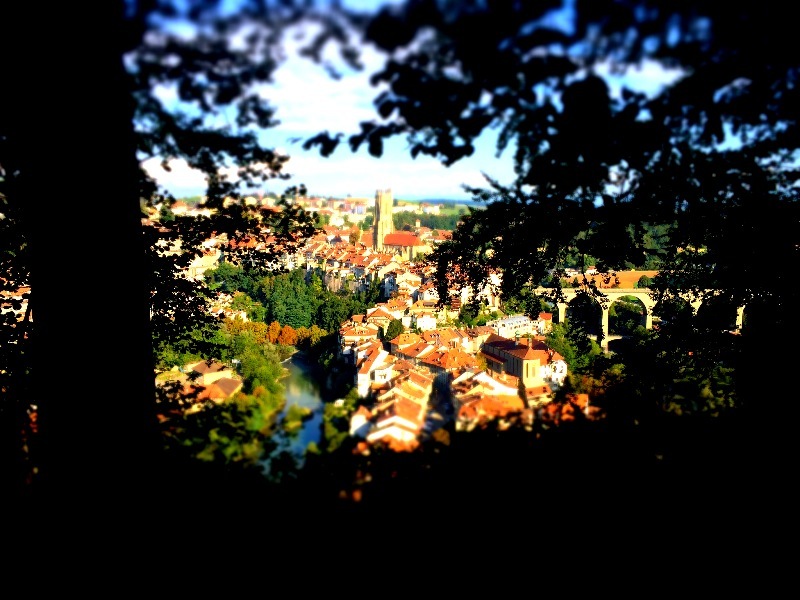 So, Ljubljana… what a pretty little city! Our AirBnB was right on the river across from the hilltop castle. Lively cafes lined the river, with locals and tourists alike strolling by. There’s a great market for fresh fruits and vegetables with a nearby covered arcade selling pastries, coffee, beer and wine. We really just wandered around and soaked up the vibe of Ljubljana. I think the kids appreciated the break from museums. I really appreciated the friendliness of the locals and just the right number of tourists – not so many that we couldn’t get into any restaurant we wanted to but enough that there was a real buzz of activity and energy. Loved it. Our only planned agenda involved dropping off donations (clothing, etc.) at a local organization dedicated to helping refugees. Preparing for our return to the U.S., we had plenty to bring, including blankets, games, a basketball and (by request of the organization) new sets of underwear (and in addition to a financial donation). A staff member kindly took some time with us to explain their impressive work. They provide assistance to refugees – primarily from Syria and Afghanistan – to guide them through the asylum process, provide trauma counseling, help them with job training, school placement, and so on. Ernst was a bit fidgety, but Fritz was wide-eyed as she described the high number of unaccompanied minors – one boy had a harrowing journey by boat, during which his pregnant mother and father drowned. 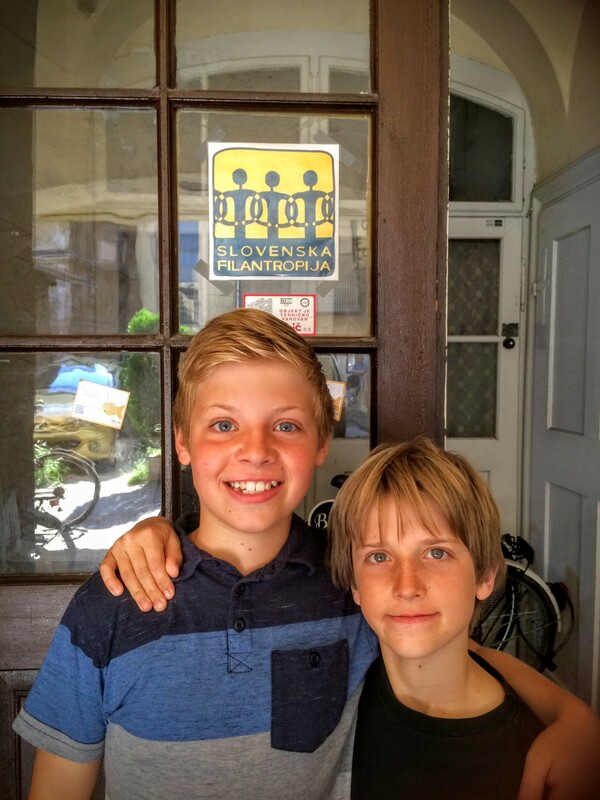 Organizations such as Slovenska Filantropija do such important work; I’m glad we stopped in. Dropping off donations at this great organization that helps refugees. 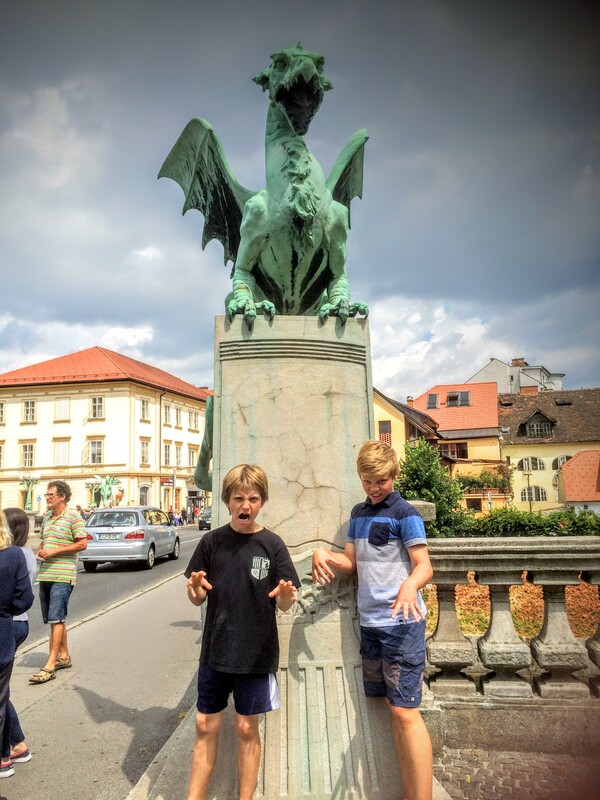 I am the Mother of Dragons (dragons are the symbol of Ljubljana). One of Slovenia’s highlights is the Skocjan Caves, a UNESCO heritage site due to its huge underground canyon. We had a lot of fun climbing around; the canyon is especially awesome. The tour is required – no solo exploring, at least on the main route (“Section 1”), and frankly it’s not much of a tour. The guide provides little in the way of interesting information, and the group is huge and diverse (English is the default tour for anyone who doesn’t speak German or Italian). Because it was raining, Section 2 wasn’t as worth it as it could have been – it mostly consists of a hike through a beautiful outdoor gully, with additional indoor cave sections. It’s definitely nice, and perhaps had this just been a daytrip jaunt, we would have felt like it was more worthwhile. However, since this was in the middle of a long day of driving, and Section 1 already involves quite a bit of exertion, we could have skipped Section 2 and been happy. 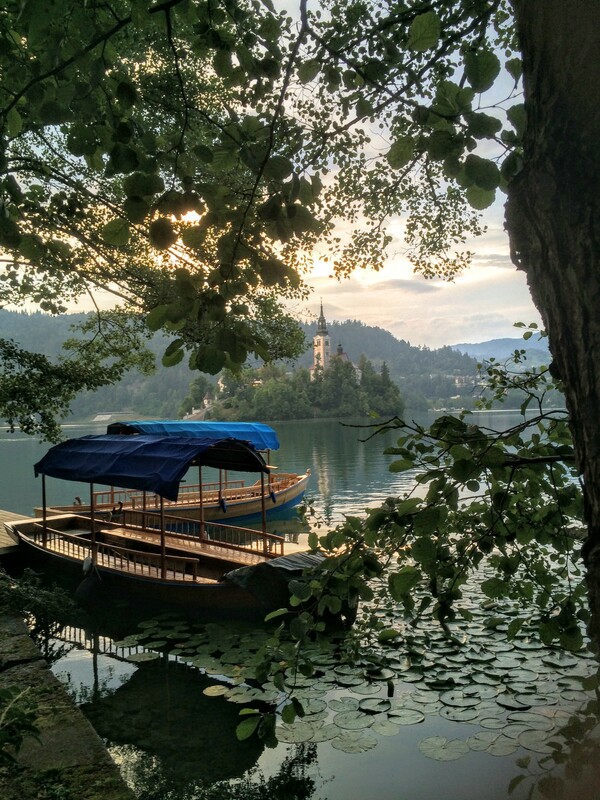 After a terrific week in Croatia full of stunning natural wonders, several romantic walled cities and a relaxing week with family, we headed back to Slovenia – this time to gorgeous, seductive Lake Bled. Always described as a “fairy-tale” setting, my expectations were pretty high, and Bled did not disappoint. With the Julian Alps as the backdrop, a castle perched atop a peak overlooks clean, clear lake complete with a pretty church on an island. Horse-pulled carriages clop by carrying tourists around the lake, and people relax on the banks, dive into the cool water or rent rowboats or paddle boards. It’s no surprise that the long reigning dictator of Yugoslavia, Tito, had a residence here – now a lovely hotel and restaurant. 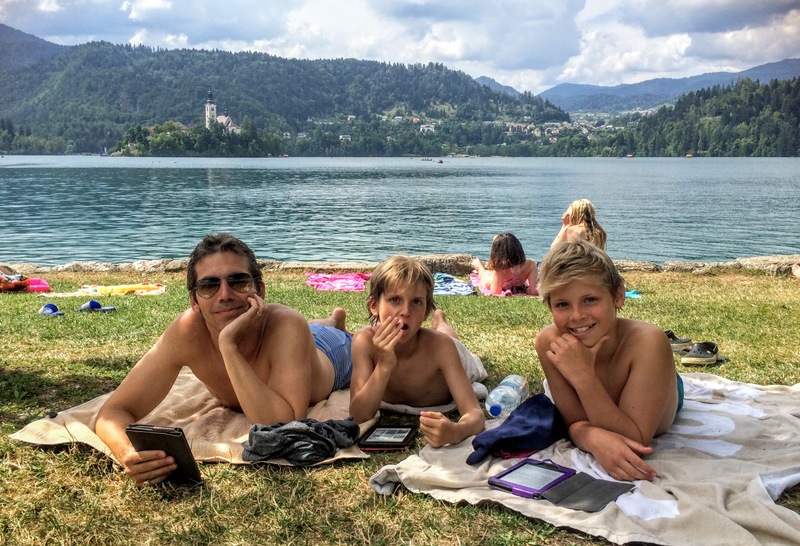 We spent our time in Bled relaxing: walking, swimming and eating the famous cream cake (delicious!). 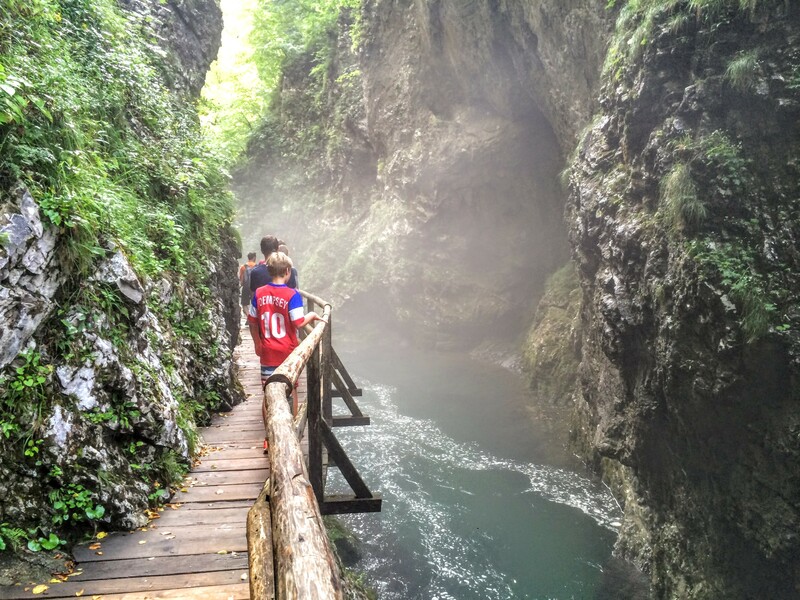 We also paid a visit to the nearby Vintgar Gorge, a beautiful hike through a magical mini-canyon. We did get there early – around 9am (it opens at 8am) – and the trail was pretty busy. But we were shocked that when we emerged, the line to get in was about 100 people deep, waiting in the hot sun. Yikes! Slovenia ranks very high on our list of countries we’ve visited! It really packs a punch for a compact country; the food is great; and the people are attractive and friendly. Thanks, Slovenia, we had a blast! 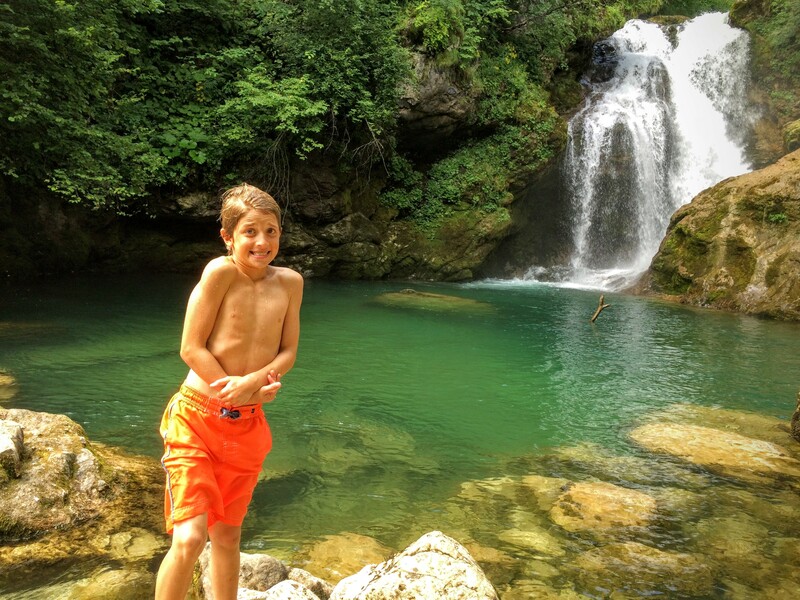 Vintgar Gorge hike – cold water! Vintgar Gorge hike – brrr! 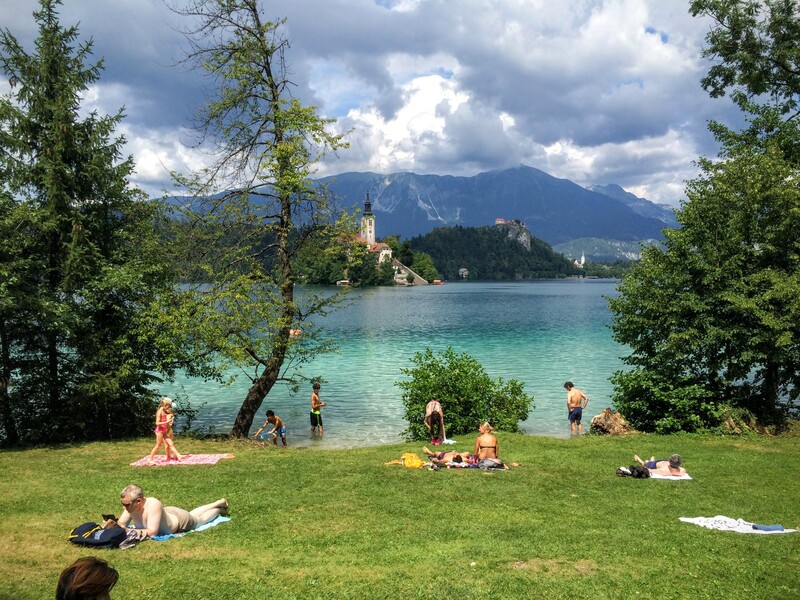 Everyone has fun in Lake Bled – swimming, boating, paddle boarding. Reading & relaxing between dips at Lake Bled. 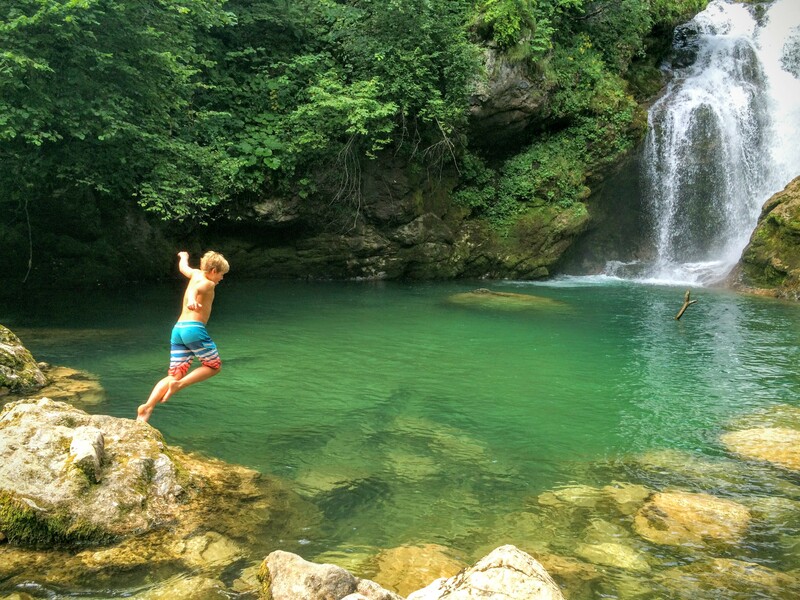 Bled is just stunning – I’ve just returned and absolutely loved it (https://worldwidewanderingblog.wordpress.com/2016/09/03/bled-slovenia/) Your boy did well jumping in at Vintgar – I felt that water and it was absolutely freezing! !